As a mom of four, it was always important for me to keep on top of household tasks, such as staying stocked with groceries, diapers, baby supplies, pantry items, etc. If not, I’d be at the store daily, and let’s be honest… no one has time for that! When I was recently invited to a baby shower, I thought long and hard about the gift I was giving to the mother-to-be. I wanted something that would keep giving vs a product that someone else might have already thought of. I decided to give a Sam’s Club membership. Two months after the baby was born, I received the sweetest thank you note, with reasons why this was the perfect gift, explaining why new moms love Sam’s Club. Buy in bulk. From diapers to wipes to formula, clothes, photo prints and household items, buying in bulk is the way to go! (Save time and money!) Check out the current savings on Baby & Toddler items at SamsClub.com. Incentives. Right now, when you sign up for a new Sam’s Club membership, you’ll receive a $20 gift card, as well as $25 in new member Instant Savings! Faster, Easier Shopping: Skip the checkout lines with Scan & Go, order ahead with Club Pickup or shop on the go with the Sam’s Club app. Samples. I love walking around Sam’s Club after school. (My hungry children love it, too!) Many brands are sampling their products in the food department, which lets me try it before we buy it! It’s great to get my children’s reaction while we are there in-store before going home and wasting items they won’t eat. *If they are really hungry, we stop by the cafe’ for some of the best pizza ever! Guaranteed Value: If you don’t love your Sam’s Club membership, your current yearly fee will be refunded in full. 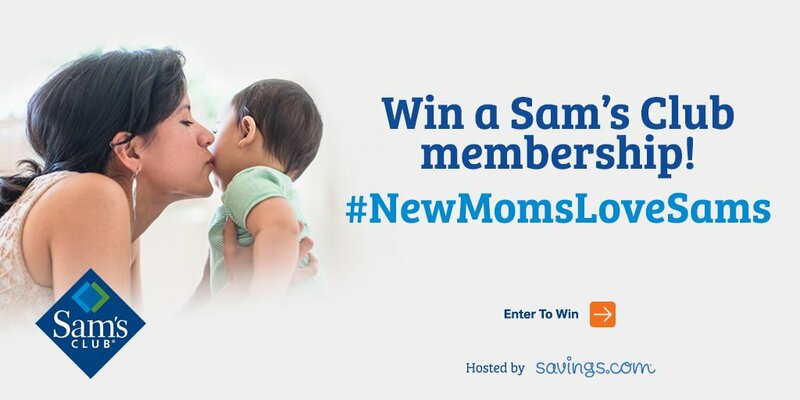 Enter to win 1 of 25 $100 Sam’s Plus Gift of Membership gift cards being given away by Savings.com. *Giveaway ends on Friday, November 9th at 11:59 PM ET.